WTI crude prices have weakened to approximately $49.20/b this morning, after continuing to decline yesterday. WTI opened at $49.22/b today, a drop of $0.46, or 0.93%, below yesterday’s opening price. Current prices are $49.21/b, $0.02 below yesterday’s closing price. WTI crude prices have opened lower in six of the last eight trading sessions, falling by 7.8% ($4.18/b, or nearly 10 cents/gallon) since April 12th. Product prices also weakened yesterday, continuing their downward trend. Diesel opened at $1.54/gallon in today’s trading session. This was a decline of 1.57 cents (1.01%) below yesterday’s opening price. 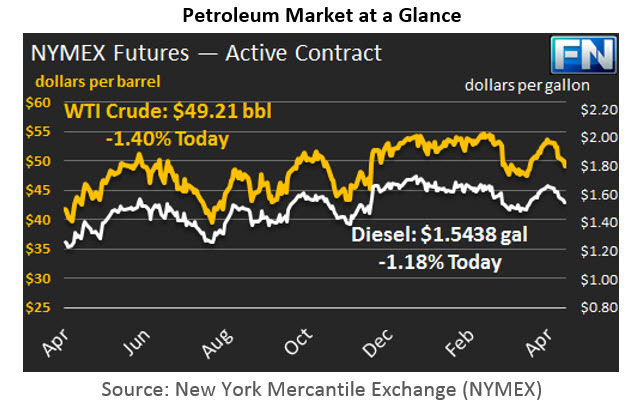 Current prices are $1.5438/gallon, up by 0.11 cents from yesterday’s closing price. Diesel prices have opened lower for the last eight trading sessions, shedding 11.45 cents, or 6.9%, since April 12th. Gasoline opened at $1.6215/gallon today, down 2.01 cents, or 1.22%, from yesterday’s opening. Prices are $1.6123/gallon currently, down by 0.91 cents from yesterday’s close. Gasoline prices have decreased in seven of the past eight trading sessions, dropping by a total of 14.24 cents, or 8.1%, since April 12th. Equities markets enjoyed a “relief rally” when centrist candidate Emmanuel Macron emerged as the leader in the first round of France’s presidential election. European markets surged, and European currencies gained against the U.S. Dollar. The U.S. Dow Jones Industrial Average opened over 145 points higher yesterday. The second-round runoff election will take place May 7th. Markets also are responding favorably to the prospect of President Trump’s tax plan, which reportedly includes action on his campaign promise of cutting the corporate tax rate from 35 percent to 15 percent. The equities rally has not lent a boost to the oil complex, however, and the market will be watching for data on inventories, which are forecast to show across-the-board drawdowns. The EIA has released data on gasoline and diesel retail prices for the week ended April 24th. At the national level, gasoline retail prices rose by 1.3 cents/gallon, and diesel prices declined slightly by 0.2 cents/gallon. Details follow in our second article.